My Crazy Bunch: Military Family Great American Road Trip Giveaway! 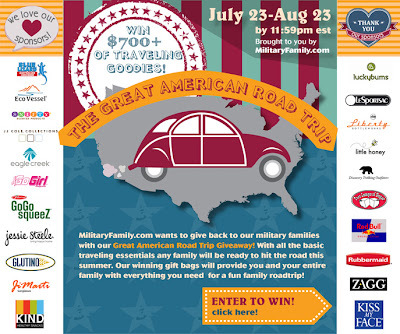 Military Family Great American Road Trip Giveaway! MilitaryFamily.com wants to give back to military families with their Great American Road trip Giveaway! With all the basic traveling essentials any family will be ready to hit the road this summer. Four winners will receive gift bags of over $700 worth of traveling goodies to provide you and the entire family with enough items to create a fun road trip experience. Enter between July23rd-August 23rd!